Elvis Presley, Singer, Actor, often referred to as the "King of Rock and Roll"
Singer, Actor, often referred to as the "King of Rock and Roll"
Elvis Presley, the "King of Rock and Roll", was one of the most popular American singers and a cultural icon of the 20th century. His hands reflect quite well the inner conflicts he faced throughout his life. The first obvious feature of his hands is a large and round mount of Venus (the ball of the thumb), which gives him a very sensual personality, as well as a love and craving for beautiful women. Elvis is well known for having many women in his bed, sometimes all at once. However, this large mount of Venus is not supported by an equally large mount of Luna. The mount of Luna filters the information given by the senses. When it is too small compared to Venus, we can never be satisfied and tend to suffer from insecurity. This seems to have been a major problem for Elvis Presley, who had basically everything he needed to be happy but - by his own admission - he was not. His thumbs are making a sharp outside angle where they join the hand: the angle of beat. This provides him with a great sense of timing especially useful in music, acting and dancing. Remember he was once called "Elvis the Pelvis"! His long ring finger - or Sun finger - makes him very charismatic. However, it is bent towards the middle finger, showing he is unsure about his success. On the left hand, the top phalange of the Sun finger has a strange shape and is also inflated. It is a sign of very high expectations for himself and for others: he was always striving for purity but not finding it. His head line and life line are joined at the origin, showing that his family - especially his mother - greatly influenced him and his values. It also denotes his high sensitivity. The long head line, showing a bright intelligence, curves into the mount of Luna, revealing an overactive imagination. However, since, as we saw before, his small mount of Luna doesn't make him feel adequate, he would have a tendency to want to stop the emotional plain, most often with sleeping pills or other drugs - which he did. The bent baby finger indicates feelings of guilt and shame. Often, people with such a finger have been violated emotionally in their childhood, but they are unable to see their parents as not ideal. When Elvis was a child and his father was away - during a jail sentence as well as other circumstances - Elvis became the little man of the house, was idolized by his mother and used to sleep in her bed. This type of parent behavior often leads to confusing relationships for the child. 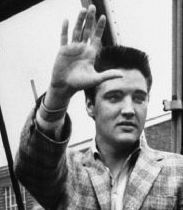 Finally, the number of rings Elvis was wearing on his hands increased over the years. 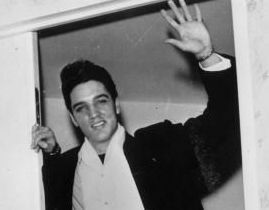 From no ring at the beginning of his career, he was wearing big rings at several fingers during his later years. Wearing several rings usually suggest insecurity, the rings being there to give courage. It seems that Elvis needed them more at that time. 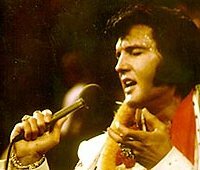 Regardless of insecurity or inner conflicts, Elvis was a giant in the world of entertainment at home and all over the world. Even though he passed away more than 30 years ago, he continues to mesmerize all generations through his countless movies and recordings. 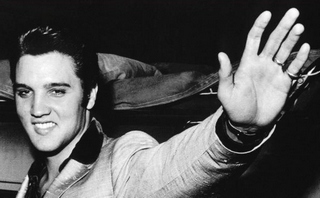 Elvis may have left the building, but he is still very present in our hearts. Thank you. Thank you very much!